When Edward Knox returned to New York City, a Civil War hero, his father’s business was in trouble. Not only had the Knox Hat Company’s store on Fulton Street burned to the ground in 1865, but a trademark law suit had put the firm in serious financial difficulties. Edward took over for his father with “the intention of making his name known wherever a hat was sold,” according to his obituary decades later in The New York Times. Knox succeeded in his intention. Rather than continue to rely on the quality of other manufacturers, Knox opened his own factory in Brooklyn. In the meantime he had opened a store in the fashionable Fifth Avenue Hotel, in addition to the one in the Singer Building on Broadway. By the turn of the century, Knox was the premier name in hats in New York City and United States presidents came to him for their headwear. Before B. Altman, Tiffany or Lord & Taylor would make their incursions onto Fifth Avenue, Edward Knox broke ground. 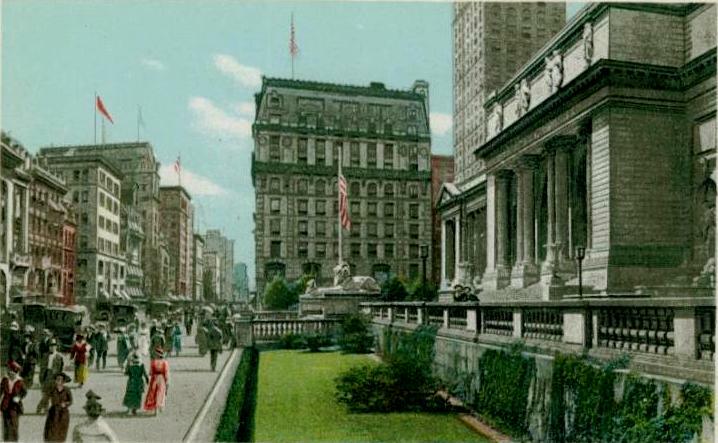 On the corner of 40th Street and 5th Avenue stood the brownstone mansion of Colonel Lawrence Kip who had died in 1899. Here Knox would build his new store and headquarters, opposite the site where the palatial New York Public Library would soon rise. Through his military standing, Knox was familiar with the work of architect John H. Duncan. Dunan, in addition to his many residential projects, had designed the Soldiers and Sailors Memorial Arch in Brooklyn’s Grand Army Plaza and General Grant National Monument (which would become better-known as Grant’s Tomb). Built between 1901 and 1902, the ten-story structure exploded Beaux Arts ornamentation on a huge scale. The two-story mansard roof with one- and two-story dormers is crested by intricate copper torch-and-anthemion decoration and dominated the limestone and brick building. An ornate balcony wrapped around the seventh floor. Because of the prominent corner site, Duncan’s magnificent structure was conspicuous for blocks down Fifth Avenue. The Knox Hat Store occupied the first and mezzanine levels; the upper floors housing the offices of the Knox Hat Manufacturing Company and the E. M. Knox Hat Retail Company and other businesses. 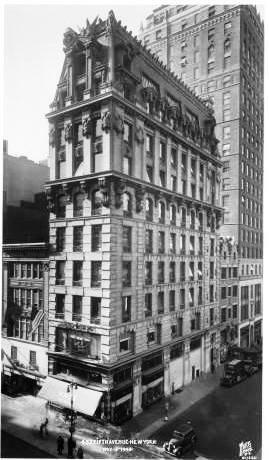 Not only had Colonel Knox (he had been elected colonel of the 69th Regiment in 1892) created a spectacular building on Fifth Avenue, he had simultaneously created immense prestige for his company and product. Edward Knox died at the age of 75 in 1916. His New York Times obituary mentioned only in passing that he “was known as a leader in the hat industry for many years, and took charge of his company more than forty years ago, and brought it through its financial difficulties, making it one of the greatest in the world.” The article spoke, however, at great length of his extensive and distinguished military career for which the Colonel was best remembered by his contemporaries. Knox’s will generously reflected his appreciation of his employees, giving sums of $1000 to $20,000 to employees like Catherine Maher, a store cashier; the largest sums to two particularly “old and faithful” employees. Very few changes to the building were made throughout most of the 20th Century until, in 1964, the Republic National Bank purchased it. 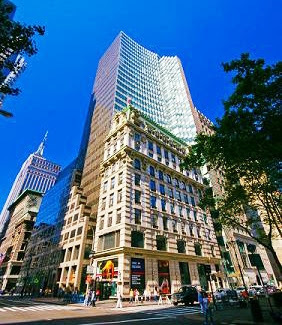 Kahn & Jacobs were commissioned to convert the Beaux Art beauty into banking and office space. With sympathetic care, the firm replaced the street floor windows with large panes of plate glass, removed the mezzanine level and slightly altered the 40th Street side. In 2006 HSBC took over Republic Bank and carefully melded it with a modern glass tower to the side and rear. In the renovation modern plate glass sheets replaced the more appropriate paned windows; however overall the landmark was treated with loving respect. Photo Nicholson & Galloway, Inc.
Façade Maintenance Design Architects oversaw a complete exterior face and roof restoration. This included completely replacing the 140-foot long, 8-foot high cooper cresting. 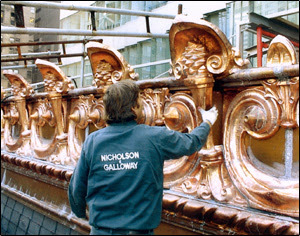 The four enormous copper cartouches were removed and restored. The entire slate roof -- all 2,500 square feet of it -- was removed and replaced with Vermont Black slate and the entire façade was carefully cleaned. In April of 2010 the building sold for $350 million. That year the new owner, Israel Discount Bank, commissioned STUDIOS to create a new entrance to the tower. STUDIOS principal David Must called the former lobby "cramped, dark and stepped awkwardly down toward street level." The recreated entrance shows the full 30-foot height using what Must calls "a simplified palette of materials." Today, a component of a larger, ultra modern whole, the Knox Building remains what The New York Landmarks Preservation Commission called “one of the finest Beaux-Arts style commercial buildings in New York City.” Looking south down Fifth Avenue, it is today, as it was in 1902, a remarkable and conspicuous presence for blocks. What a great remembrance you have. Glad I could contribute to your knowledge of it. I live in Upstate NY and am attending a benefit Prohibition Party at the local "Utica Club Brewery" It has a 1920s theme and my friends band is playing. I just purchased a Knox Premier Straw Boater hat on Ebay for $40. I will authenticate my costume with its history. Glad to find out a bit of the history. We went to an estate sale yesterday and came across a beautiful just like new Knox silk hat. It appears to have hardly been worn but the box is very old and beat up. My husband loves hats and buys expensive cowboy hats quite often. He really felt he needed this one so he bought it. He wore it last evening to a murder mystery wedding dinner and was selected to be the preacher. He looked very dignified in his new hat. I am sure he will be wearing it quite often as we do things that require costumes and actually he can just wear it if he likes. Fun stuff. GREAT looking hat! It's in wonderful shape and the box is fantastic. Very cool. Glad you have the history behind it, now. Helping my 82 year old dad clean out closets today. As a young business man he often wore hats to work and church. Came across an old and very cool hat box and inside it was a Knox New York Hat. It is in new condition and he gave it to me which is cool. Yes. His middle initial was "M"
I purchased a knox hat today. The RN # is 50001, style 15 6059 250, lot # 8758. I can't find any information or pictures with this hat. Can anyone help? My grandfather worked as a buyer and designer of Knox hats.... Just wish I knew more.